In the opening scenes of "The Fellowship of the Ring, " we see Samwise Gamgee gardening in front of his circular, yellow front door in the Shire. In Middle-earth, these massive rock structures mark the "Paths of the Dead, " a haunted trail leading through the White Mountains. Here's a look at Edoras, the capital city of Rohan and home to the people of King Théoden. 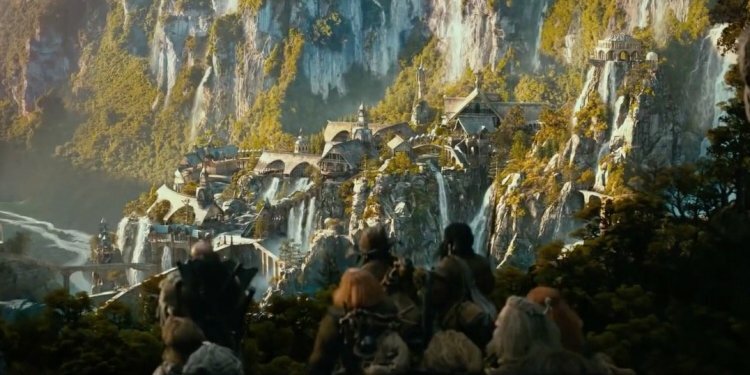 As Frodo, Gandalf, and the gang set out from the Elven city of Rivendell, they exit under this giant stone archway, which you can see on the left and right sides of this scene. The park's lush wooded paths and beautiful waterways made for the perfect setting for Tolkien's Elven paradise. In "The Fellowship of the Ring, " Aragorn leads Frodo and the others towards the decimated watchtower of Amon Sul, better known as Weathertop. On their journey through Middle Earth, Aragorn, Frodo, and the others paddle past the massive Pillars of the Kings, or Argonath, which loom over the Anduin River. Mount Doom is Frodo's destination on his perilous travels across Middle Earth. The fires there are the only way to destroy the ring.